Fruitless Pursuits: It's a Cabin! In the Woods!! It's a Cabin! In the Woods!! To start, an apology. I haven't been around to post much of late. It's been busy. But I'm back now, and one of the things I've been doing in my time away is re-thinking slightly how I go about making posts on here. With any luck that means you'll be seeing more of me around here now...we'll see if that actually happens. Now to business. If you've somehow found your way to the wonder that is Fruitless Pursuits, you're likely at least a little geeky. If you're even a little geeky, there's a pretty good chance you've heard of Joss Whedon. He's the creator of things like Buffy the Vampire Slayer, Angel, Dollhouse, and Firefly. He's also directing what may just be the biggest nerd-thing of 2012, The Avengers. But that's not the only thing coming out in 2012 with Whedon's name on it. Meet Cabin in the Woods. 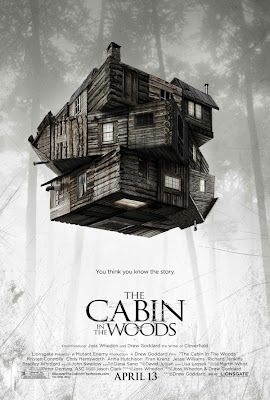 Co-written by Whedon and Cloverfield's Drew Goddard, and directed by Goddard, it promises to be a different take on...well...the old trope of the "cabin in the woods". The MAKING of the movie has its own sordid details. It was actually filmed in 2009 but was delayed when MGM, who produced the movie, ran into financial ruin. Okay, that's not really sordid so much as it is sad. Bright side, it also delayed the Red Dawn remake (Wolverines! ), which according to rumor was actually pretty awful. The point is that the movie is now, finally, set to come out on April 13th, 2012 (in the US at least, not sure about elsewhere) and one of the bigger pieces of news on the internet today was that they've released the first trailer!! Also, please enjoy this poster! So...what do we know? Well, for starters, it stars Chris Hemsworth and was filmed BEFORE he did Thor. Also seen in the trailer is the nerdy guy from Dollhouse. One of the girls looks familiar, but I can't place her. There's definitely some kind of Truman Show-type vibe here, where these kids have been led to what appears to be a grand stage of some type. In today's reality television obsessed world, I could see this as a logical conclusion. There's some kind of zombie-type monsters involved too. Supposedly even the poster is a clue, which makes me think there may even be some kind of alternate reality at play...but that may be slightly far-fetched. So that's what I've got...what about you? feels a lot like the cube and that poster does sort of push it in that direction. I guess unlike The Cube where you had people who could possibly work it out you have the cast from Scooby Doo. I'm surprised there wasn't a dog. Most Memorable Presents: KOTA THE DINOSAUR! Minecraft Lego.. Possibly Coming Soon? Clone Wars Recap S4 E12: Slaves of the Republic!